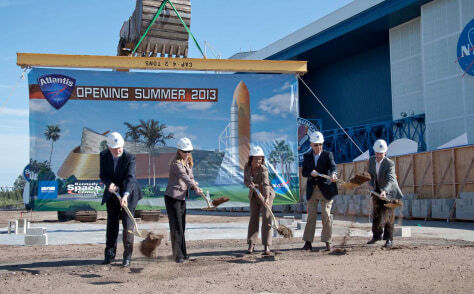 Ground is broken Wednesday for a $100 million, 65,000-square-foot exhibit dedicated to the retired shuttle Atlantis at NASA's Kennedy Space Center Visitor Complex in Florida. From left are Bill Moore, chief operating officer of the Kennedy Space Center Visitor Complex; Janet Petro, deputy director of NASA's Kennedy Space Center; Florida Lt. Gov. Jennifer Carroll; Jeremy Jacobs, chairman and chief executive of Delaware North Cos.; and astronaut Chris Ferguson, commander of the final Atlantis flight.